As I’m sure you’ve noticed, I haven’t written over the summer, but now that Nathan’s back in school and things are winding down, I figured I’d give an update on what all has been happening the last number of weeks. Nathan has graduated preschool with flying colors. And oh! He taught himself how to read overnight. Literally. He went camping with Paul’s family, and when he left, he didn’t know how to read. When he came back, he had a surprise for us; he read the entire book “Are You My Mother” from beginning to end! He got stuck on a couple of words but otherwise glided right through it. I couldn’t believe it! I am one proud mama. So now summer is over and my baby is officially a kindergartener! I’ll be honest- I was afraid summer break was going to be really rough considering how difficult transitions are for him. But it was really great. Don’t get me wrong, he definitely had his “off” days, but it was such a joy to have both of my sons home with me. I’ve also started a chore chart with Nathan. It’s an app on my phone called Chore Monster. Basically, I come up with a few chores and assign them a certain number of points. Once he accumulates points, he can pick out rewards such as ice cream, X-Box time, something out of the prize box, etc. He loves it, and it’s teaching him concepts such as saving up his points for the bigger rewards. And he also lost his other bottom tooth! And both of his top teeth! John is growing up so fast. He’s finally, FINALLY now eating table foods. We had the hardest time getting him to eat any of it because he would gag and puke any time we put anything with texture in his mouth. He’s finally gobbling up Cheerio’s, Saltines, all kinds if fruits including bananas, grapes, strawberries, and cantaloupe and now eats the same things we eat for dinner. Spaghetti is his favorite meal EVER. I’m glad the pureed baby food days are behind us. That stuff was expensive, and he ate about 13-15 jars of it a day. (Yes, he totally eats like a man.) AND, he’s just super cute sitting in his high chair, eating the same things we eat. Especially spaghetti. Oh yes, watching him eat spaghetti is priceless. He’s great at games where you put shapes in the right sized slots, and he loves books and to be read to. He’s still not saying any words other than Mom and uh oh, which he says about everything, but he is finally pointing at things. He was waving, but he’s stopped. He was also saying other words such as dada, ball, bye bye, and hi, but he’s stopped that as well. I don’t know if it’s considered regression or if he’s just stubborn. We’re really hoping this isn’t a marker for autism. Since Nathan is on the spectrum, John is considered “high risk” and has a 1 in 4 chance of being on the spectrum himself. I’ve brought up my concerns to the pediatrician, and he said it’s hard to tell since he’s so young and that the issues I’ve brought up wouldn’t normally concern him, but since John’s big brother is Autistic, that is what makes these behaviors concerning. And the higher functioning on the spectrum he could be, the harder it is to diagnose when they’re younger. I’m not particularly worried about it, though. It is what it is. And if John ends up being anything like his big brother, then we’re going to have two brilliant boys on our hands. Plus, if that’s the case, we’ll already know how to deal with it since we already have one child on the spectrum. John has also started walking, and it’s the second cutest thing ever! 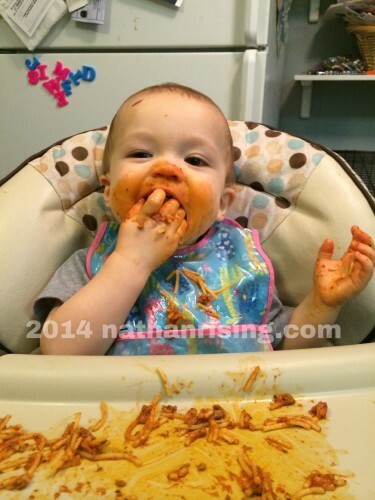 (The first being watching him eat spaghetti.) He high-steps with every step and is very proud of himself. I love the sound of his little feet slapping on the hardwood as he toddles all over the place. Oh how I love this stage. In other news, Nathan made himself a new friend! A very dear friend of mine, M, who has been my close friend for about 15 years, has an 8 year old son, E, with high-functioning Autism and a 6 year old son, A, who is neurotypical (that’s the “politically correct” way of saying non-Autistic. Well E had a birthday party a while back, and we were invited. It went wonderfully! See, whenever I try to have playdates with Nathan, kids without Autism just don’t get him. They don’t understand him and are not on the same page as him. Nathan ends up getting upset and worked up and meltdowns typically ensue. But sweet E was different. They got each other immediately. It was so heart warming to see. 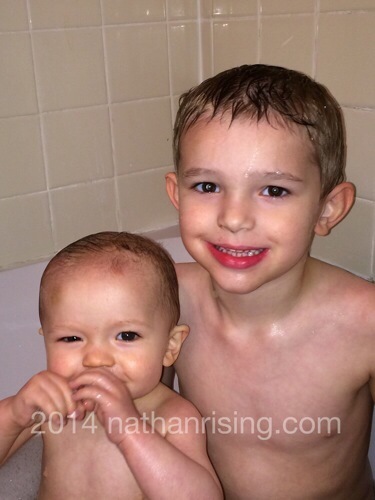 And since A’s older brother is on the spectrum, even though A is not, he totally understood Nathan as well. There was lots of spinning in circles, happy hand flapping, and in depth conversations about Star Wars, and everyone had a grand time. They spent most of their time in E’s room, lost in their own little worlds as they played Lego’s together. And then when it was time to leave, I warned my friend M that there might be a meltdown… she and her husband laughed and said that in fact, there might be two meltdowns and E is prone to them as well. When it was time to go, Nathan was on the verge of losing control but I was able to talk him down by assuring him he would see E again soon. As for kindergarten, Nathan is rocking it!! Academically, he already knows everything they’re teaching. They’re teaching how to count to 20- he can count to 100 forwards and backwards. They’re learning the ABC’s- he knows them all and can already read. He already knows all the shapes and colors and numbers. He already knows simple math. So the downside of this is he gets bored. He ends up finishing his work and walking around the class doing the other kids’ work too. His teacher is awesome, seriously. She gets him and can really can relate with him. So she tells him what a good friend he is but that the other kids can’t learn how to do it if he does it for them! I used to do the same thing in school. I clearly remember how utterly boring it was, so I refused to do my work. I’d put big X’s on the paper and write “this is stupid” and then I’d go so the work for the other kids. Unfortunately for me, I had a teacher that didn’t want to deal with me so she tried to put me in the intellectually disabled class. I’m so thankful Nathan doesn’t have a teacher like that. She’s told me he mostly plays alone in he playground, but he seems happy. That’s just part of autism… As long as he’s happy, I’m happy. 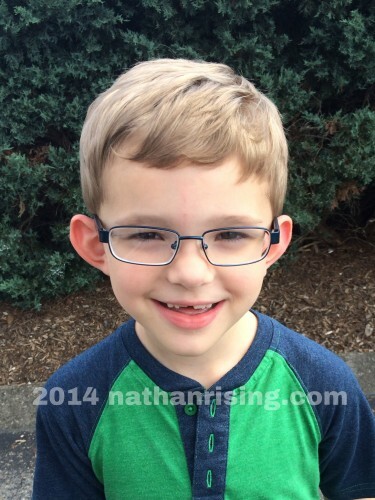 Nathan has also started wearing glasses! He’s so stinking cute in them! But oh man, is it a hassel to get him to keep them on. He’s already bent them all up, accidentally stepped on them and sat on them, and the lenses have popped out. A couple days ago on the playground at school, one of the lenses popped out. Nathan and his teacher looked for it, and then Paul and Nathan went back to school to look some more after Nathan got home, but no luck. We had to order a new lense. I’m going to have to get one of those bands that goes around the back of the glasses to hopefully help keep them on. Of course, Nathan will still be able to take them off if he wants to, but hopefully the band will make it to where he can’t remove them absentmindedly. So all in all, things are going great here. I miss Nathan when he’s at school, but he absolutely loves going is is a sponge for learning. My kids make me so proud. Sweet baby John is nearly a year old now. A YEAR. How crazy is that? He’s pulling himself up on furniture and starting to cruise around a little. He eats like a man- 13-15 4.25 oz jars of baby food A DAY. I pretty much have to suppliment by making as much homemade baby food as I can to offset the cost. (Baby food is expensive at around 55 cents a container. It adds up!) It’s so much cheaper to make my own. For example, for about $10, I made about $60 worth of baby food. Sweet peas, butternut squash with apples, bannannas, applesauce, pears, and prunes are among his favorite homemade foods. We don’t give him a lot of prunes and pears any more, however, because those definitely work well to loosen up his bowel movements. He’s still on Stage 2 baby foods. He has a pretty strong aversion to any type of texture whatsoever. Even if I mash something like a teeny tiny piece of bananna and put it in his mouth, he’ll gag and throw up. The pediatrician said this is pretty normal for his age and to start brushing his tongue with a toothbrush twice a day to desensitize him. Oddly enough, however, the tongue-brushing doesn’t bother John at all, and he will even hum while I do it. Crazy baby. 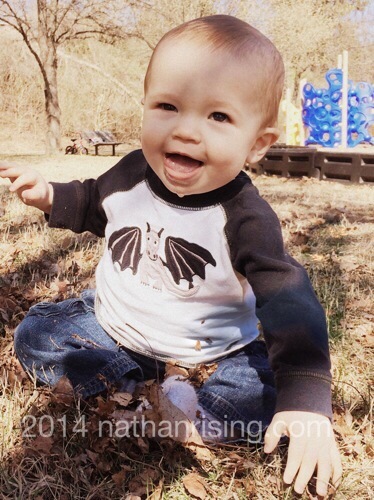 He has about four top teeth and two bottom teeth, with two more starting to poke through on the bottom. And he is chewing on everything! I seriously have to make sure I keep my floors swept because he’ll pick up anything from random bits of debris to tufts of cat fur and put them in his mouth. I always know when this has happened because I’ll hear him start to gag. Once, I even had to stick my finger down his throat and do the “finger swoop” to discover he’d tried to eat a piece of paper which had then gotten stuck in his throat. Oh that baby stresses me out with his eating everything! 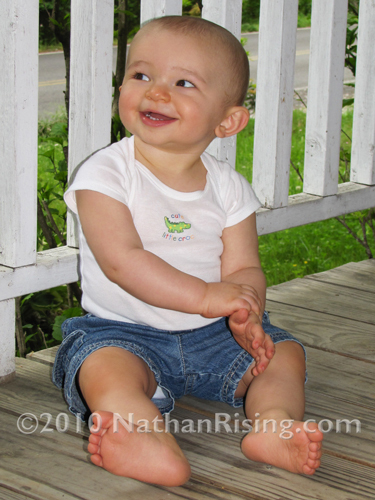 But one look at his beautiful smile and everything is a-ok.
And look, below is a picture of Nathan I put on this blog about four years ago when he was about the same then age as John is now. Look at how similar they look! I love it! My brother and I don’t look much alike- he looks more like our dad and I look more like our mom. So for me, it’s so cool that my boys look so much a like. They even have the same smile! Handsome little fellas, I tell ya. Nathan is all-in-all still an amazing big brother, but now that John’s older, Nathan is definitely starting to have his moments. Sibling rivalry, perhaps? I remember picking on my poor sweet baby brother constantly when we were little, so I can’t say what he’s doing is suprising. Thankfully, these moments are still far outweigh by how patient and loving he is towards John. He’s great with keeping John occupied and sharing his toys with him. 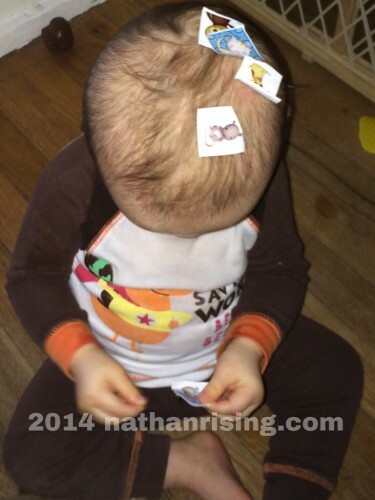 He’s even “decorated” his brother with stickers! 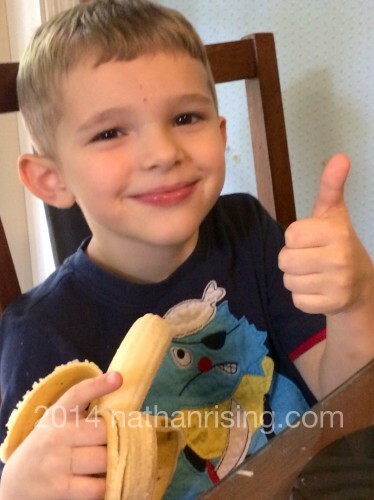 As for Nathan, he is about to graduate preschool and will be moving on to Kindergarten in the fall. I can’t believe my oldest baby will be in elementary school. He’s doing fabulous in school, and his testing shows he has far exceeded his peers with excellent scores on his academic testing. I’m telling you, this kid is brilliant. The main issues he lags on is still his fine and gross motor skills and social skills, but fortunately, he’s receiving the appropriate help for those at school (due to him having high-funtioning Autism.) Gosh, I sure do love my Nathan. Oh! 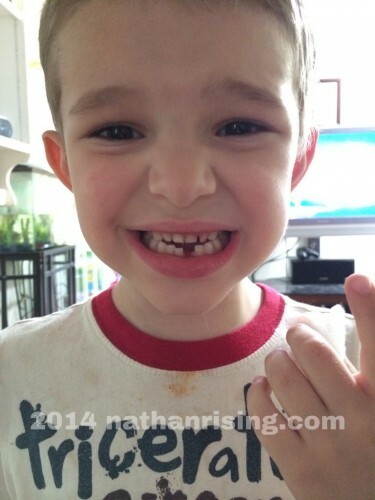 And Nathan lost his first tooth!! It was one of his front bottom teeth- the first one he got when he was 6 months old. We noticed it was loose one day, and a few days later, it was definitely ready to come out. I asked Nathan if he was ok with me pulling it out and he exuberently replied with a resounding YES! So I pulled it out. I didn’t even have to pull hard. And Nathan didn’t cry! That night, we put it under his pillow, and since it was his very first tooth that he lost, the Tooth Fairy left him a Lego set along with a little note. He was as proud as he could be. I, on the other hand, found the tooth-loss to be bittersweet. My baby is growing up. And when I look at that little tooth (which I have saved, of course), I am flooded with memories of all the times he bit me, all the baby foods he ate with that tooth, the transition to table foods… it’s hard not to get teary-eyed sometimes. My boys are the most wonderful things to have ever happened to us!! Even with their moments of bickering, they are practically inseperable. I LOVE it! Wherever you see one, you’ll more than likely see the other. It is my hope and prayer they continue to be close as they grow into adults. Having a sibling is awesome, especially one you’re really close to. Just look at those sweet little faces. We are so blessed to have such amazing kids. Our hearts are full. I know it’s not as cold here in Tennessee as it is in, say, Minnesota, but I have to say- IT’S SO COLD!! It was about 18 degrees or so this morning when we got up and now it’s about 8 degrees. We have the heaters on and a fire going in the fireplace, and I still have a chill! There’s no mistaking that winter is here! It’s nice, though. I like cold winters. Now if we just had a decent snow, it would be perfect! My awesome brother came up to see me this weekend. We had so much fun! (Of course, when do we not? Ha ha!) We gorged on a ton of sushi for lunch. It’s funny because we both like really spicy food, so we ordered the spiciest sushi on the menu. Nothing! It wasn’t even close to spicy for us! Of course, this is coming from someone who orders her food extra spicy- meaning pile on the hot peppers! So after that, we went ice skating in Knoxville. I hadn’t been ice skating since I was somewhere around the age of 6 years old… so about 25ish years. It was hilarious because when I first got out on the ice, the best I could do was hold onto the rail for dear life as my legs scissored and I didn’t go anywhere. After a while though, I started getting the hang of it, so by the time we left, I got to the point to where I was skating more towards the middle of the rink, away from the rail! And get this- I only fell once. Not too shabby, huh? The funny thing was once I fell, I couldn’t get back up! My skates kept sliding out from under me, so I had to wait for my brother to make it back around so he could help me up. It was awesome! He, of course, was a great skater- mostly, he said, because he used to rollerblade a lot when he was younger. So he pretty much taught me how to skate. One of the biggest tips I can give anyone trying to ice skate is to make sure you get your laces as TIGHT as you can. You need that ankle support to keep your ankles from turning in. In fact, I got my first pair of skates so tight that the laces snapped in half. Then I had my brother lace up the second pair as tight as he could, and from then on out, I was great. The only irritating thing was the tweens/teens who would congregate in groups on the ice along the rail. When I was first trying to figure out how to skate, I had to stop multiple times because they were apparently so self-absorbed that they were completely oblivious that they were causing a traffic jam. Small kids and adults alike had to stop and wait on those fools. I finally got to the point to where I just barged right through the groups. I got a few dirty looks, but hey, not my problem! So after a couple hours of cold hands, sweat, and sore ankles from the tight skates, we decided to head out. We headed over to the mall because he wanted to get the boys some gifts. We sat in those massage chairs and laughed at ourselves for hanging out at the mall. And then? For dinner, we ate at the Cheesecake Factory. If you’ve never eaten at one, GO! And get a slice of cheesecake while you’re at it- it’s heaven on a plate. Seriously! It was fabulous! Our server was lousy, but we just focused instead of how much fun we were having. I’m always so sad when our days together are over and he has to head back home. I only get to see him a few times a year, so we really make sure to make the time count. We’re loud and obnoxiously immature when we get together, but it’s our stress release. And besides, I have to admit, it’s pretty funny watching other people’s reactions. Hey, you only live once, and it keeps us young! And who cares what other people think anyway! I’m working on a Christmas post to put on here at some point. I’m almost done writing it, now I just need to put the pictures up. I miss having a smartphone! It really makes writing posts and uploading pictures so much easier! Hope everyone had a merry Christmas and happy New Year; we sure did! Stay warm out there, everybody!